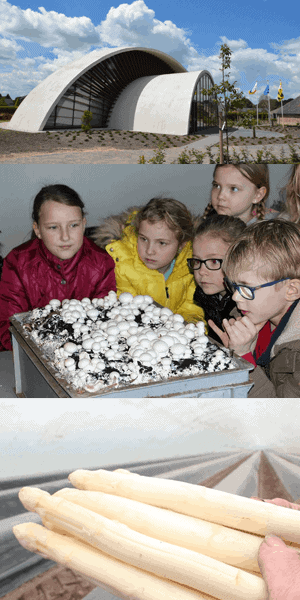 De Locht is a museum about rural life, asparagus, mushrooms and greenhouse farming. Visit the Museum in the north of the Dutch Limburg region, and you’ll enjoy the closeness of nature, and go through how the people here in the countryside used to live and work last century. De Locht deals with the modern era as well, and would like to present itself also as an information centre for asparagus and mushroom cultivation and greenhouse farming. On arrangement groups can also visit the museum at other times. The museum is opened on holidays, except 25th of December and 1st of January. The Museum presents in a pleasant way a good overview of the life of people in the north of Limburg in the first half of the 20th century. It started with the farmstead, built in 1859. Extensions have been added in the following decades until it got its present 120-yard-long façade. During a tour you almost have the impression that you could encounter one of the former residents every moment. Look in the cosy kitchen, where family life took mainly place. Then continue to the “best” room with its cupboard-bed, the mezzanine room and the cellar. Most people were poor, but the house gave a certain comfort and time for a little chat was always there. This atmosphere is still felt today. In the stable and barns you will see the old agricultural tools which give an impression of the daily hard work in agriculture. Upstairs you can find several old crafts, which offer insight into the everyday work of our ancestors. For agricultural development in Northern Limburg, the specialisation in asparagus and mushroom cultivation was of great importance. The north of Limburg is Holland’s most important region for the production of both asparagus and mushrooms. The sandy soil is very suitable for asparagus. This vegetable -already popular in antiquity- is harvested in the months of May and June. The production of mushrooms was started by the co-operation between pioneers in the field of improvement-research and the first mushroom-cultivators. Mushrooms can be harvested throughout the year. The museum shows how compost is made and shows the production of mushrooms in caves and modern cells, as well as the packing process. In this way you can exactly track both the asparagus and mushroom cultivation from the initial stage to the final product. Furthermore you will find a historic auction-clock, which can still be taken in operation at specific events. In the greenhouse farming pavilion the development of the greenhouse horticulture over the last 100 years in the south-east of the Netherlands is exhibited. The pavilion shows the development in five stages from cold frame windows to a high-tech greenhouse. In the latter visitors, but also the branch (press) in particular, are informed about today’s technological evolutions in greenhouse horticulture. Follow the tour and look at the small bakery. Visit the barns with large agricultural machinery and equipment, the smithy, saddlery, syrup kitchen, sheep stable, poultry house, chapel and more. During your tour, you walk along flower-, kitchen-, and herbs-gardens. Regularly demonstrations take place, mostly on Sunday afternoon, where artisans demonstrate their old professions. Every last Sunday of the month bread is baked in the traditional way. In this way De Locht wants to keep the past alive. In the restaurant there is a possibility to enjoy a cup of coffee with real Limburg flan, or delicious pancakes and several other drinks. Guided tours in English language are possible, as well as the multimedia presentations. For children there is a room with several old-Dutch games and an outdoor playground. On Sunday afternoon often special activities for children are organised. Besides the permanent exhibitions, temporary exhibitions can be found regularly. The museum has accessible toilets as well as an elevator that leads to the exhibition rooms upstairs. Museum De Locht is located within the famous nature reserve Peel and Maas. The area is ideal for long bike rides.